Many people think they don't want to mess with the trouble of roosters and baby chicks, but when it's a lovely spring morning and you go out to gather eggs and find a little chick under a hen, it's a wonderful feeling. Raising your own chicks saves you money from having to go and buy your own chicks and it's really enjoyable to raise a bird from the very beginning. You can also purchase an incubator and hatch your own chicks from eggs, but you'll have to assume a less than 100% success rate. Chicks have only a few requirements, but these requirements are critical. Chicks can be fragile, especially in their first month, and your diligent care will be important in their upbringing. As with handling any birds, remember that keeping things clean is critical. Wash your hands thoroughly with soap and water or use hand sanitizer before and after working with your birds. It is possible to purchase eggs and incubate your own chicks. This can be done using either a broody hen or incubator. However, for first time chick owners, you'll likely find it easier to start with chicks that are approximately two weeks old. This is a wonderful gift if you have one. Bantam silkies or silky crosses typically make wonderful broody hens, but almost any Bantam breed has a tendency towards broodiness. If you have the option, this is a more natural and fun route. When the chick does hatch under the hen, allow them a few hours together and then you may wish to remove the chick the chick housing until it is large enough to be released with the other birds. If you have an appropriate nesting box: not too high off the ground with a ramp where the chicks can safely enter and exit, getting to water and feed and there is no danger of being injured by other birds in the coop, you may wish to leave your chicks with the hen. The downside of this is that if the hen is still sitting on a number of eggs, her attention will get split between her live babies and the remaining eggs and there is a good chance some of the remaining eggs will get abandoned - another reason you may want to remove the burden of caring for the chicks from the hen. If you decide to use an incubator, it is recommended that the first time you use it, you operate the incubator with a small quantity of inexpensive eggs to be assured of your operating procedure and the performance of the incubator, before attempting to hatch large quantities of eggs or expensive eggs. You can purchase an incubator or build your own. There are many different incubators on the market. Look online at your options and select carefully. The least expensive ones sometimes have reviews that contain statements saying they are not very reliable in terms of temperature control and turning the eggs. Be sure to carefully follow the instructions that come with your incubator. An incubator or brooder is designed to bring normal room temperature to the desired temperature. Be sure to use a thermometer in the incubator to ensure you know the exact temperature. The thermometer will always be sitting on the wire floor of the incubator. In a still air incubator, the closer you get to the top of the incubator, the higher the actual temperature. Room temperatures of 60 degrees F or below will reduce the temperature in the incubator. Room temperature changes of 10 degrees or more will change the temperature in the incubator. The change is more pronounced below a temperature of 70 degrees F.
Candling is a way of checking the fertility of an egg and the development of the embryo, with the use of a light source (a flashlight is frequently used) in a darkened room. Eggs can be out of the incubator (or away from a broody hen) for up to 20-30 minutes before starting to cool down inside, so don't rush. You can GENTLY roll the egg on the light source to get the best view. Carefully hold the egg up to the light to observe the contents of the egg. The embryo is located at the large end of the egg, where blood vessels will be present under the surface if the egg is fertile. The embryo appears as a dark spot which becomes larger as the incubation period continues. Candling can be done at any time, although day 8 onwards is usually when the embryo is more easily identified. Remove the eggs that obviously are not developing. There is a chance that a non-developing egg will crack or explode in the incubator, and that is messy and STINKY. I wouldn't candle after day 16 or 17. The eggs are mostly chick (black mass) and air sac by then anyway, and they should be left alone for the last few days before hatching (no turning from day 18 to the time the eggs hatch). 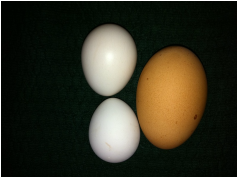 Dark and/or brown shelled eggs are more difficult to candle than white or pale shelled eggs. Fertile egg : The egg will appear to have a black spot which as the embryo grows and incubation continues will grow larger until light will only pass through the air cell end of the egg. Infertile egg: Eggs appear clear. Dead embryo: If the egg was fertile but the embryo has died then you will see a blood ring around the yolk or possibly a dark spot dried to the inside of the shell depending on when the embryo stopped growing.